Size of this preview: 800 × 563 pixels. Other resolutions: 320 × 225 pixels | 1,743 × 1,227 pixels. Scansione di una cartolina Argument datata 1945. Data indicativa, per indicare gli anni '40. Retro. Sull'altro lato di File:194x-Argument-Postcard-Front.jpg. Dal documento originale. 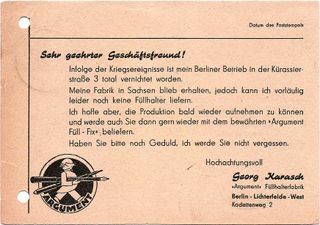 Cita come indirizzo: "Kadettenweg, 2 - Berlin-Lichterfelde-West". 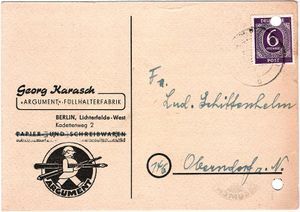 Scanning of a postcard by Argument dated 1945. Guess date, stands for the '40s. Back. On the other side of File:194x-Argument-Postcard-Front.jpg. From the original document. Mention as address: "Kadettenweg, 2 - Berlin-Lichterfelde-West".